FHWA conducted a scan tour of HSIP practices in Alaska, Illinois, Massachusetts, New Hampshire, North Carolina, Oregon, and Utah. 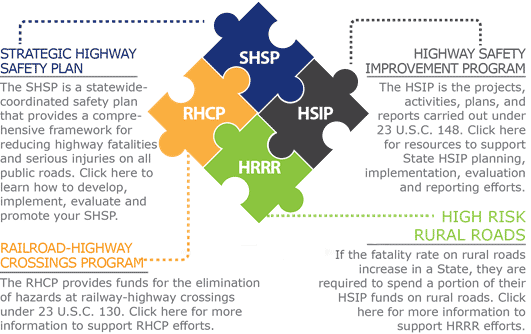 The Scan Tour final report highlights notable practices in the areas of HSIP administration, planning, implementation and evaluation for each of these States. Synthesis of Local Road Safety Noteworthy Practices This synthesis report summarizes noteworthy practices and lessons learned from local road safety peer exchanges and various other local safety publications produced over the past five years. HSIP Noteworthy Practice Series The HSIP Noteworthy Practices Series presents case studies of these successful practices organized by specific HSIP topics. The individual case studies provide summaries of each practice, key accomplishments, results, and contact information for those interested in learning more. Local Safety Scan Several States were identified to participate in the Local Road Safety Domestic Scan, allowing a team of transportation professionals from the Federal, State, and local levels to visit and document their practices. This report identifies and documents those practices in the planning, programming, and implementation of efforts to improve local road safety.